You care about your employees. And you care about your company. When the holidays roll around, it’s important to consider the needs of both your company as well as your employees when deciding on the perfect gift. Holiday gifts for employees can be a major expense for a company and business leaders like to know that they’re investing in gifts that are not just worthwhile for employees, but also worthwhile from a marketing perspective. This is also why many companies are ordering the most coveted digital devices on the market as gifts this year, and are having them laser engraved with the company logo. Gift items that will be used regularly make terrific marketing tools for a company. Consider a laser engraved iPad, iPhone, iPod, Nook, or Kindle. These devices, when given as gifts, not only market your business to potential clients who see them in use, but also relay the message that your company is willing to invest in employees (and clients) to put them on the cutting edge. Companies giving the gift of technology, laser marked with their company’s logo can’t go wrong. Laser Impressions uses a tightly controlled process to permanently place your company’s brand on an iPad or iPhone, for example, and does not damage the Gorilla Glass. Instead, this process embeds the company logo on the underlying materials, resulting in a smooth, protected surface that is readily displayed every time the device is used. Laser Impressions uses technology capable of embedding logos and designs into almost any kind of material including wood, plastic, metal, or glass. 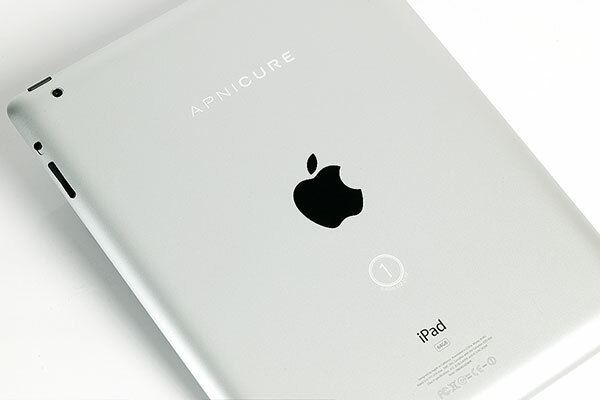 A laser engraved Kindle or Nook will display the company logo on the back of the device by laser engraving the logo into the plastic while a laser engraved iPad and iPhone will have the logo etched into the metal underneath the glass. The design capabilities of laser engraving are limitless and the results are sleek and professional. If you want your holiday gift to multi-task for you this year and make employees feel happy and appreciated while marketing your business to potential clients, give the gift of laser engraved technology. To speak with a laser engraving expert about gift possibilities for your company this holiday season, please call (800) 344-LASER or send us an email. Laser Impressions specializes in laser engraving services for the iPad, iPhone, iPod as well as Kindle and Nook devices.